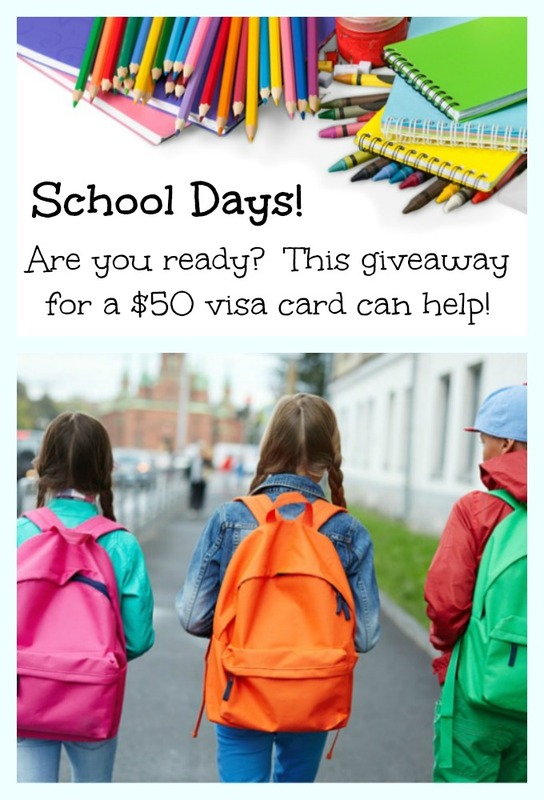 Back to School, the 60’s vs Today, plus a $50 Visa Giveaway! School is rolling around once again! And it seems with each passing year the start date is moved up a little bit earlier. My grandchildren in California return to school on August 9th! In the 60’s, every school year started the day after Labor Day. We didn’t have to wonder when it was going to start, we knew. Security. If you didn’t mind your teacher, you were promptly sent to the principal’s office for a swat on the bottom delivered by a firm hand and a large paddle. I never wanted to get into trouble. We knew who was in charge! We all lined up dutifully to receive our smallpox vaccine. A few days later when the large scabs appeared, some of the boys thought it was very brave to try and knock one another’s scab off. Yes, we wear those scars with pride! My favorite part of kindergarten was snack time. A delicious cookie and good ole’ chocolate milk. Oh, the unhealthy horrors! During recess in elementary school one of our favorite things to play was boys chase the girls and if they caught us they got to kiss us, which never worked out for them because the girls defense was a well-placed kick to the shin. Did we only play that at my small little school in Missouri, or did you play it too? In elementary school we had book bags, not backpacks and we didn’t have to buy very many supplies. There was none of this buying of Kleenex, Clorox wipes, baggies, hand cleaner, etc. We learned math, the real math, not common core math. Parents everywhere are now at a loss when it comes to helping their children with math homework. We started every morning in our classroom by standing, saluting our American flag and pledging: “I pledge allegiance to the flag of the United States of America and to the republic for which it stands, one nation under God, indivisible, with liberty and justice for all.” Does your child, or grandchild’s school say the pledge of allegiance? Ok, enough of the 60’s! We are talking about right here and now. 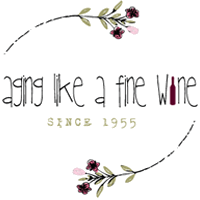 I’ve joined with hop hosts Viva Veltoro and Lindsey Blogs at SEBG and a group of other great bloggers to bring you a giveaway hop full of back to school prizes. 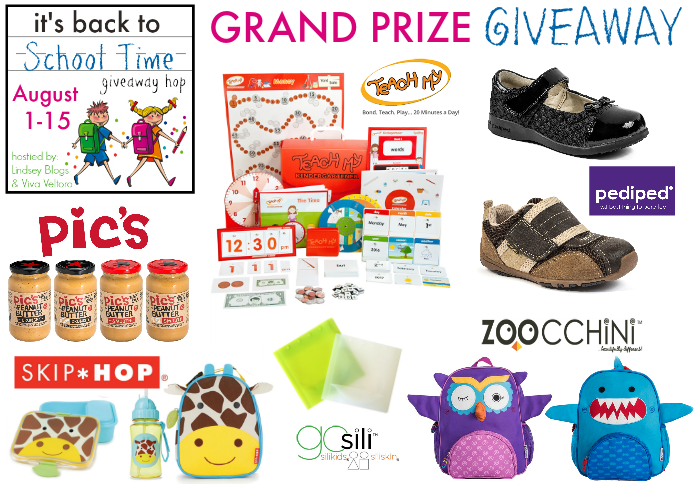 Be sure to hop around to all of the blogs listed at the bottom of this post and don’t miss that great Grand Prize! What I’m offering as a Back to School giveaway is a $50.00 Visa gift card to help you with buying those Kleenex, Clorox wipes, and baggies, etc! So complete the form below to enter now for a chance to win, and good luck! Lindsey Blogs So Easy Being Green, Viva Veltoro and the Back to School participating bloggers are not responsible for sponsors who do not fulfill prize obligations. I always loved organizing and opening all of my school supplies!! My favorite!! I loved school supplies too and now I love office supplies! My favorite school memory is in the 4th grade when my teacher gave us a big Party at the end of the year. It was so much fun and she was my favorite teacher! 4th grade is a big transition year. I’m sure it was a truly special party to have become a favorite memory. I’m sorry it didn’t work out for you! It sounds like you thoroughly enjoyed your moment of stardom though. That’s great! I can just imagine how truly special that was. I’m sure it was for your Grandfather as well. I honestly do not have any favorite school memories. I immensely disliked school from the very beginning to the very end! I was teased horribly, which today would be considered bullying, and it was awful. I’m sorry you don’t have any good memories of school. I know how difficult it can be and how mean kids can be. I wish I could change that for every child. My favorite memory is when I got a huge award in front of everyone. In the 70’s, I was in an open classroom. It was a class made up of 4th and 5th graders. I was in this class for two years and it was great. It was more about learning at your own pace and our creativity was explored. I loved getting new school supplies. Sharp pencils. Crayons that weren’t dull. Brand new round-edged scissors. Unfortunately, the “school” part of school, well, not so much. In order to demonstrate the reactive properties of sodium, our chemistry teacher dropped a small piece into a tray of water, where it made a satisfying pop. She then tossed in a small bit of the rather more reactive potassium, and with a huge blast it rocketed to the ceiling, while a grand mushroom cloud slowly spread and crawled across the ceiling from wall to wall to wall. Students spent the rest of the day tossing buckets of water at the ceiling, where little chunks of potassium continued spitting out streams of sparks until we could be sure they’d all of reacted away. And that is my favorite memory from school. My favorite school memory is eating and sharing lunches with my best friends. My favorite school memory was getting dressed up for Halloween and having the school parade. My favorite school memory was dressing up for Halloween and having a school Halloween party! One of my favorite school memories was walking my oldest daughter to school when we lived in California a few years ago. I really miss it. I had a lot of anxiety and depression issues during my school years, and some of my best memories are how caring and loving and understanding a few teachers were of me. They really helped me get through a lot. I remember the special shopping trip with mom when I was going into the 4th grade, I got the best dress ever, I wanted to wear it every day. In elementary school we used to have a group that came to the school and performed a play like Tom Sawyer and Huckleberry Finn once a year. That was a very special treat to see real actors and actresses in action. The play costs 25 cents to see. My favorite school memory was my year in the 1st grade. I had the greatest teacher and the best teacher I had in all my years of school, Mrs. Mackey. She really was one of a kind! i nthe third grade i won the story telling contest amd it was a really big deal for our school! My BFF in kindergarten was Terri. When we were having snack time our teacher got mad because we were blowing milk out of our straws. Back then if you were in trouble, you had to lay your head down on the table. Miss LeFleur, (that was really her name) was so mad at us that she made us lie down completely on top of the tables. Unfortunately, for me, the tables were side by side so Terri & I could still see each other. When I looked at Terri, I started laughing…I couldn’t help it. Huge mistake…Miss LeFleur marched over and slapped me right across the face. I mean she totally wiped that smile right off in an instant. If a teacher did that these days, they’d probably be fired or at the very least suspended. But back then, swats were expected if you misbehaved….and if your parents found out, you were in even more trouble when you got home. Yikes! My favorite school memory was having fun in art class! especially pottery, as there was no other way I’d get to be able to use a kiln! I remember my parents attending a musical show during the 4th grade. My favorite memory was walking to school with all my buddies. My favorite school memory would be meeting my best friend in third grade, when we were forced to sit together! First day back and seeing all of my friends! My favorite school memory was playing the lead in a play. My favorite memory was taking a creative writing class in the 8th grade back in the 60s. Ms. Thelma Briggs was the most wonderful teacher I ever had and the only time I was a teacher’s pet (as we were called back then). It sounds sort of weird now, but they also made children in my elementary school sit on a tall stool in front of the entire class with a tall pointed hat sort if like a Merlin hat that had DUNCE written on it. If you answered too many questions wrong, they sat you on the stool. They also taped a dragon’s tail to your backside with the word “TATTLETAIL” written on the tail if you voluntarily told on anyone without being asked to tell on them. Kids had to walk down the halls, go to lunch, the library, etc., everywhere they went all day, but most never had to learn that lesson again. Of course they also paddled kids back then, but more in junior and senior high. I never had to suffer any of those indignities. I guess they just didn’t worry about destroying the students self esteem or confidence back in those days. I live in North Carolina and I am 61. Does anyone else remember those odd punishments? Thanks! I only remember the scary principal’s office and his paddle! I never had to visit his office either, just the knowing was enough to keep me in line. My fav memory would have to be singing in chorus! I loved singing and traveling. We had a blast! We were pretty good if I remember right too. haha God bless and good luck everyone! I loved my 5th grade teacher, she is an amazing teacher and did so many fun activities and field trips! My favorite memories are lunchtime. My mom would make some of the special lunches. She would occasionally make something unique for Peru. One of my favorite school memories is of my favorite teacher and how special she was. My favorite memory from elementary school was every time we had a reading challenge because I would always win for reading the most books! I loved getting new crayons, that’s about it. My favorite school memory is also my saddest. My grandmother had just passed and my friends could see how distraught I was. They hugged me and sheltered me when I began to cry in class. I’m so sorry that you lost your grandmother. I’m glad you had such good friends to provide support. My favorite school memories was when we had nighttime Christmas programs and the whole school would participate and we would dress up and the different grades would sing Christmas songs and then Santa would deliver us stockings! My favorite memory of school was my really nice third grade teacher. She just knew what she was doing and had it together. My favorite college memory was writing all of my assignments down in my planner at the beginning of each semester. It was always great to have everything written down, as well as to delve into what I would be learning about. My favorite school memory was helping to decorate the classroom for parties. My favorite memory was when my parents would walk me to school and it was only 5 minutes away when we lived on base! I remember that the school was right across the street from our house and we could play on their swings when school was out. Recess was my favorite time! We used to spend the hour on the playground! They tore down the playground a few years ago and now my daughter has the new playground to use!